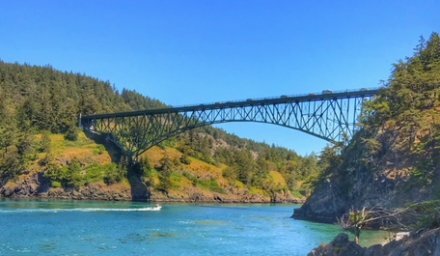 We took a few days in Bellingham to visit Ran’s son and daughter-in-law and new baby, as well as do our usual romping around the surrounding natural attractions, including Deception Pass and Mount Baker. We started the adventure with a drive up to Mount Baker along Highway 542 (Mt. Baker Highway)… well, as far as we could drive since the highest parts of the mountain were still snowed-in, and will be for months. We made it to just beyond the ski area and admired all the mountain views. Such a glorious experience, but we want to come back in the fall some time in the future to experience Artist Point, which is said to have amazing vistas, as well as numerous trails. On the way back we took in the dramatic Nooksack Falls, which is along the currently fast-flowing Nooksack River. Water rushes between a massive boulder, crashing down about 90 feet into a deep and rocky river canyon. (Trivia note: The falls were featured in the movie, The Deer Hunter.) The signage is weak, so look carefully for NF-33, about 8 miles east of Glacier, WA. 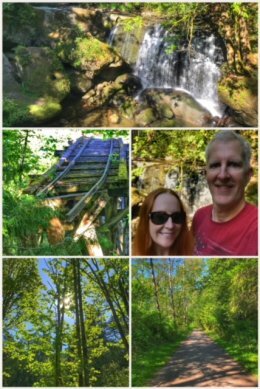 About 6 miles west of the falls (and about 2 miles east of Glacier), we stopped for a wonderful hike along the Horseshoe Bend Trail, which also follows along the Nooksack River. The trail is easy-to-moderate, with a few elevation changes, but worth it because the forest is lush and the river runs wild. We hiked the trail for a couple of miles before heading back to Bellingham. Plenty of more challenging trails can be found throughout the Mt. Baker-Snoqualmie National Forest, which has a ranger station in Glacier where you can get maps and additional information. You can find hiking, camping, fishing, picnicking, and more at the 3,854-acre park. A section of the Pacific Northwest Trail (PNT), a national scenic trail, also winds through the park. The park has 77,000 feet of saltwater shoreline and 33,900 feet of freshwater shoreline on three lakes. Next up? 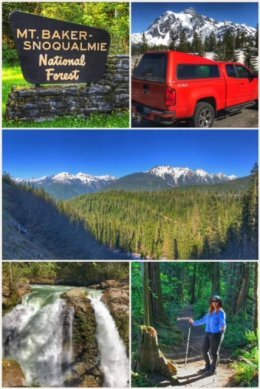 A return to the Cascades — and our next national park adventure! 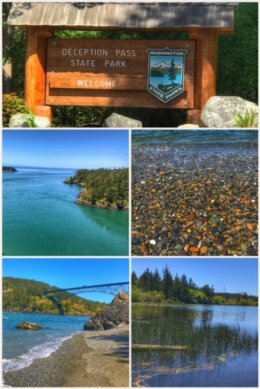 Next Post:Stop 30: North Cascades National Park… and More!